My studio is on Water Street in Gardiner, Maine. I put a sign on the sidewalk when I’m there for people to make their way up off the street. I’m fortunate to have a studio large enough for me to have separate spaces to experiment, make a mess, store work, and display work for clients. I love old objects, they are very inspiring to me and I’ve surrounded myself with them in the space. 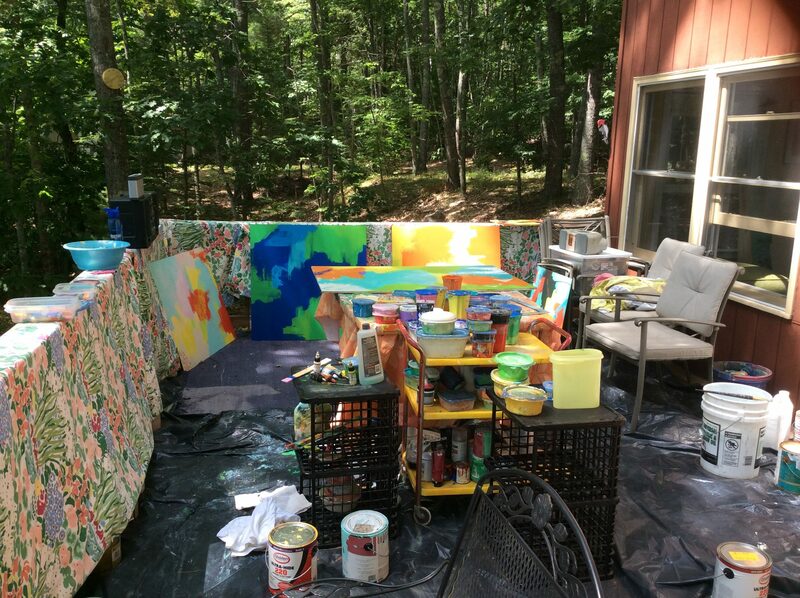 This is my outdoor summer studio on Patton Pond outside of Ellsworth, Maine. The deck of our camp becomes my studio in the summertime and it is my favorite place to paint. I cover the deck with a tarp, and the railings with someone’s beautiful curtains I bought for a dollar at a yardsale. This enables me to throw paint which I love to do… I have 2 boomboxes on either side blasting my favorite music, or radio program from WERU. This is where it all happens for me. I am usually alone during the week, and often the only one on our side of the pond, which gives me complete freedom to express myself. The music is my conduit, and the paint flows through me easily and effortlessly here. It feels magical, and is a little slice of heaven. I often dance while I’m painting, and eventually jump in the lake! My studio is in my home. I gather rubbings from the streets and cemeteries every place I visit. I assemble the parts into kimonos, collages and papier maché objects. The upstairs bedroom has a full adjacent bath, two small skylights and track lighting. I need floorspace because I assemble my art on the floor. Bookshelves and tables are shoved against the walls to optimize space in the middle. I move around my art a lot like a vixen tending her cubs. For collage, I work on a table, but often end up on the floor. 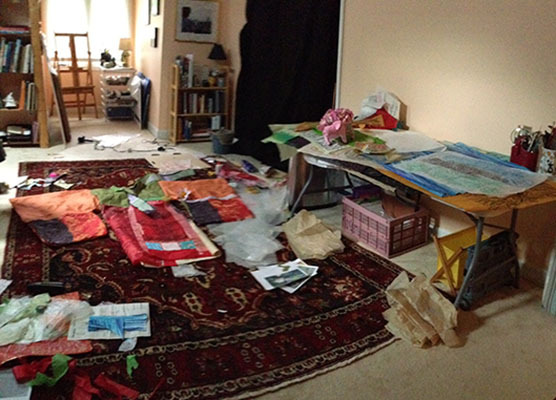 I periodically do a massive re-arranging of my studio which I find invigorating. Storage is a challenge although usually I have an exhibition somewhere which helps. I also disassemble and re-purpose my own art. The process of rethinking a piece of art is rejuvenating. 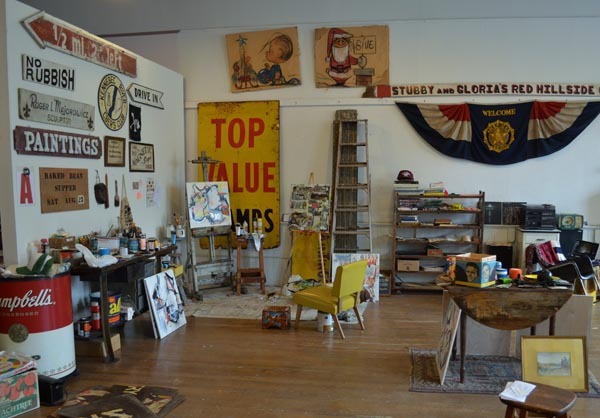 My studio is an old woodworking shop that was built entirely with salvaged materials. 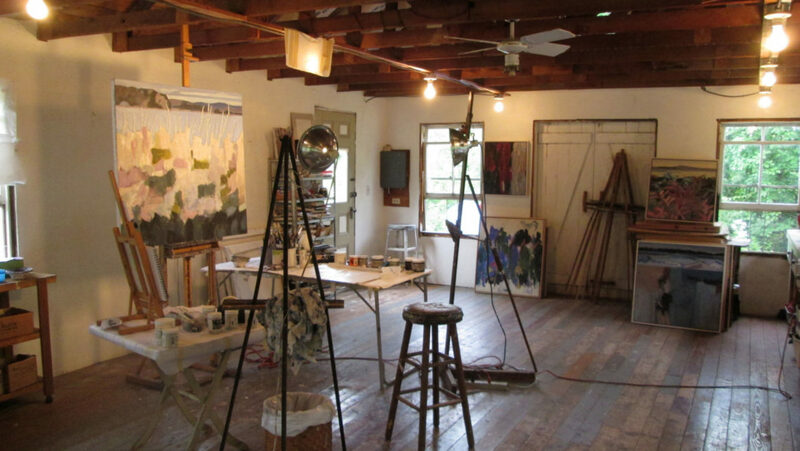 Although it is extremely “rustic,” it’s a place where I feel alive and creative. I don’t have a phone or computer in the space, so I’m able to paint there free from interruptions. On early summer mornings, the light is especially clear and the open windows give the place a wonderful air of freshness. 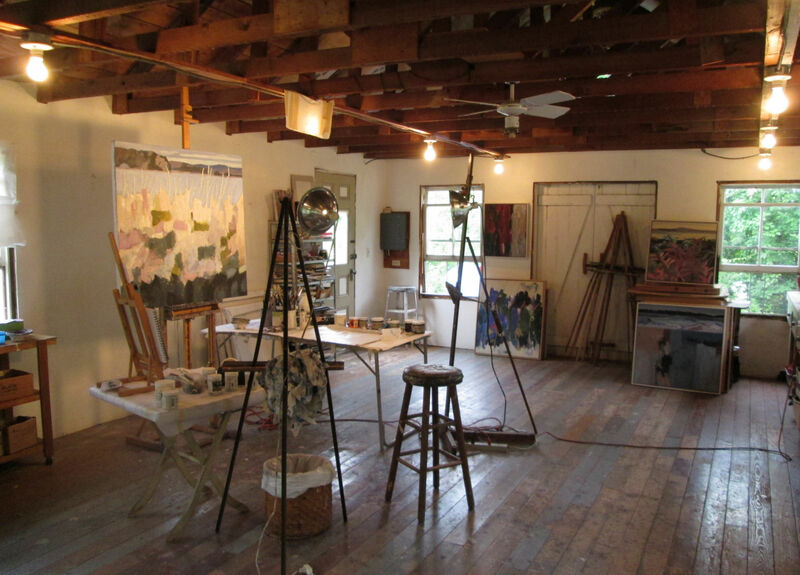 In late fall, because I am unable to heat the large open space, I pack up my paints and easel and move into my winter studio, a renovated space in the basement of my house. Although the basement space is smaller and the atmosphere is much different, I am able to continue working there and stay toasty warm at the same time. Ah, the joys of being a year-round artist in Maine.